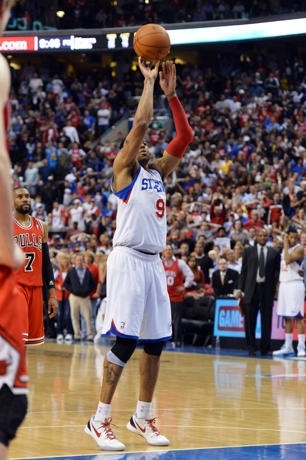 The Philadelphia 76ers are heading to the second after narrowly defeated the Chicago Bulls 79-78 in game 6. Andre Iguodala drained two free throws with 2.2 seconds remaining to put Philly ahead. C.J. Watson would heave up a desperation half court shot that nearly banked in as time expired. Iguodala led the Sixers with 20 points and 7 assists. Luol Deng had is best game of the series, albeit in a losing effort with 19 points and 17 rebounds. The Boston Celtics hung on in the final seconds to send the Atlanta Hawks home for the summer. Hawks big man Al Horford made 1 of 2 free throws with 3.1 seconds remaining to cut the Boston lead to 81-80. Paul Pierce would come down and make two free throws to put Boston up 83-80. Atlanta couldn’t get up a final shot as time expired. Kevin Garnett had a throwback game for the Celtics with 28 points, 14 rebounds, 2 assists, 5 blocks, and 3 steals. Paul Pierce pitched in with 18 points, 7 assists, and 5 rebounds. Josh Smith led Atlanta with 18 points. The Celtics will meet up with the Philadelphia 76ers in round two. Boston will have home-court advantage and will host game 1 on Saturday night. The Denver Nuggets ran out to a 13-0 lead in game 6, a lead that they would never relinquish. The Nuggets finally caught fire from the outside and were able to pound the Lakers. 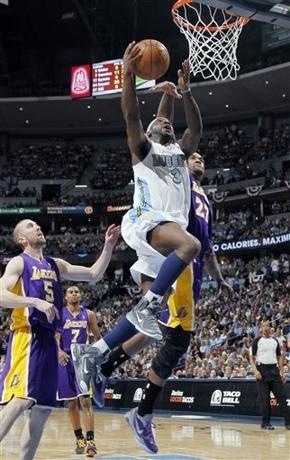 Ty Lawson had a massive game with 32 points, 5 rebounds, and 6 assists. Rookie Kenneth Faried was a beast down low scoring 15 points and grabbing 11 rebounds. Corey. Brewer added 18 points off the bench. Kobe Bryant, who was battling the stomach flu scored 31 points, while Andrew Bynum finished with 11 points and 16 rebounds for the Lakers. Game 7 will be played back in Los Angeles at the Staples Center on Saturday.